The focus of the Fak’ugesi Festival in 2018 is the role vernacular and traditional cultures in digital culture and practices. What would you call a vernacular algorithm? Is it hidden knowledge that exists deep in language and culture. 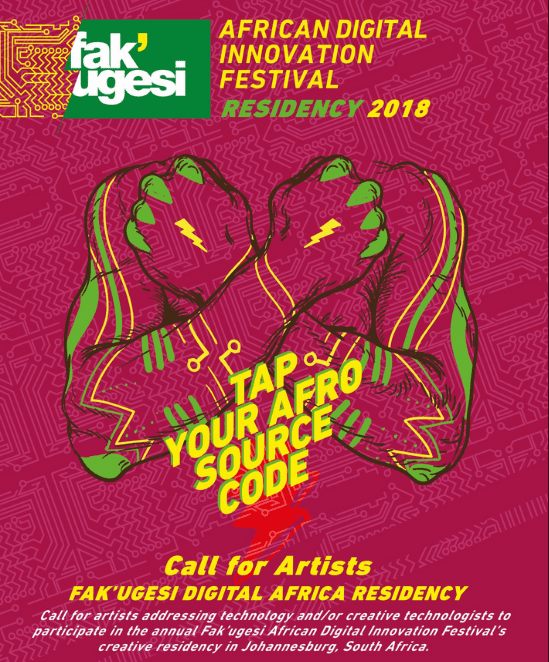 In 2018 Fak’ugesi Festival calls on you to explore the algorithms, patterns and fractals of your indigenous culture! In digital art, music, animation, memes, architecture, poetry, games, VR or the way you braid your hair! The residency will also involve the participation of artists from North Africa, South Asia and Switzerland. leading up to the presentation of preliminary work and ideas in the context of the Fak’ugesi digital arts festival in Johannesburg in September 2018. Travel to and from Johannesburg, accommodation, per diems, foundational production budget. Some mentorship and production support towards an exhibition. Residency Expectations: Successful applicants are required to be in Johannesburg for the full residency period. Residents are expected to develop work in residence (either collaboratively with the other residents or independently). Residents are expected to engage publically through their practice with attendees via either workshops or talks. The required residency outcome is to produce a work (the format is open: installation, screen based, performance, app, game, etc.) for a final exhibition to open on Friday the 8th September 2017 as part of the Fak’ugesi Festival program in Johannesburg.